After Just one season using a Gason 1880RT air seeder, grain grower Dean Griffiths, of “Carolaen” near Donald in Victoria has reported significant savings in his cropping program cost inputs. The Gason 1880RT calibration technology - which recorded some of the best results in recent independent Kondinin Group air seeders trials - was a major draw card for Dean, who switched to precision farming in 2003. By entering data on previous yields, rainfall and soil types, the software allowed him to calculate accurate fertiliser and seeding rates for each paddock, according to Dean. “ The calibration was ‘spot on'. By using press wheels, the result was a 25 per cent improvement in germination through better seed-soil contact,” he says. “This allowed us to cut-back the seeding rate and, using variable rate technology, fertiliser costs were reduced by between 30 and 50 per cent in some paddocks. Mr Griffiths, a dryland farmer, said this has helped to maximise the benefits of water harvesting, by allowing water to run freely into the furrows. A fourth generation broadacre cropper, Mr Griffiths, in partnership with his father and his brother, runs an intensive 2400 hectare (6000 acre) cropping enterprise which includes wheat, barley, canola, lentils, chickpeas, lucerne and beans. 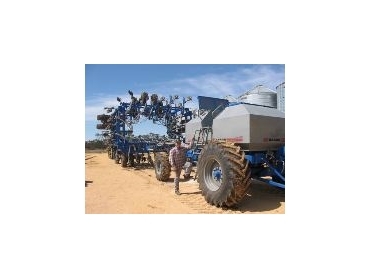 Dean believes he will recover his estimated $60,000 investment in auto-steer equipment within two years and the cost of the Gason 1880RT airseeder within five years. “The air seeder was bought as an investment over 10 years, but it has well and truly already begun paying for itself,” he says. While the Griffiths' equipment is predominantly John Deere, Dean says he was impressed with the Gason air seeder which he had seen at various field days. “I was particularly impressed with the air seeder's strength and clearance and the follow-up from Gason when I enquired about a 50ft double-fold instead of a 60ft double-fold for transport reasons. This means Dean no longer needs a Victorian road permit to transport an air seeder with dimensions greater than 6.5m wide and 5m high. This has also saved additional cost. “I looked at a lot of machines and did a lot of homework before deciding on the Gason 1880RT air seeder mainly because of its strength and clearance, and because it would complement my operation.